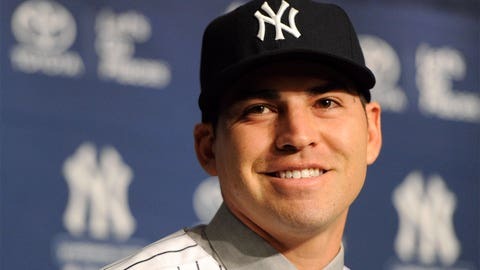 Jacoby Ellsbury is now in the Bronx with a new megadeal. Jacoby Ellsbury is leaving Boston, but he’s not doing so without one final tip of the cap. 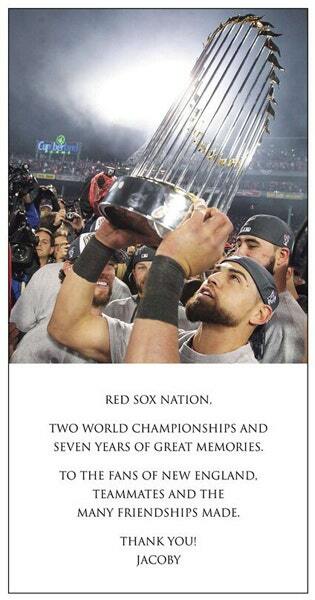 The center fielder, who signed with the Yankees in free agency after winning his second World Series with the Red Sox this fall, has taken out a full-page ad in The Boston Globe thanking fans and teammates. Ellsbury was introduced with the hated rival Yankees early on Friday, where he decided to wear No. 22, the number Roger Clemens once wore when he was with the Yankees. The Rocket wore No. 12 his first year, in 2000, then switched to No. 22 after that. No doubt, any number he wore drew ire fore the jilted Red Sox faithful, but now seeing Ellsbury will likely conjur those memories.